Methods to measure the local surface creep compliance of time-dependent materials are proposedand validated in the regime of linear viscoelasticity using nanoindentation. Two different bulkpolymers, Polymethyl Methacrylate (PMMA) and Polycarbonate (PC), were employed in thevalidation study; though it is expected that the methods developed herein can be applied for verysmall amounts of materials and heterogeneous materials. Both Berkovich and sphericalnanoindenters were used to indent into the material in nanoindentation tests. Two loading historieswere used: (1) a ramp loading history, in which the indentation load and displacement wererecorded; and (2) a step loading history, in which the indentation displacement was recorded as afunction of time. 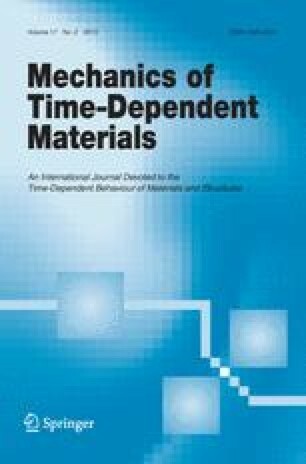 Analysis of the linearly viscoelastic material response was performed to measurethe creep compliance functions for the two materials under two different loading histories. The limitof linearly viscoelastic behavior for each of the two materials was determined through theobservation of the indent impression recovery after complete unloading; it is postulated that linearityis achieved if indentation impression is fully recovered after unloading. Results fromnanoindentation tests generally agree well with data from conventional tension and shear tests. It hasthus validated the techniques of measuring linear creep compliance in the glassy state usingnanoindentation with the Berkovich and spherical indenter tips.